We would love to take our scooter out and ride. We do it most evenings. Scooter Day was on May 19. I didn’t even know there was such a thing! My son played on a scooter at his friend’s house last weekend. Now he’s begging for one! This would be a great surprise for him and I know he would spend lots of time on it this summer! We missed National Scooter Day! We’ll participate next year by going for a ride! Well we missed it! Looks like we will have to make our own scooter day! My son loves to ride my old scooter. We took a cruise around the neighborhood. Our 8yo on the scooter and our 10yo on the RipStick. Our toddler was confined to the stroller, she’s just not coordinated enough to handle the 2 wheels scooters yet…a Micro Kickboard scooter would probably be perfect for her! 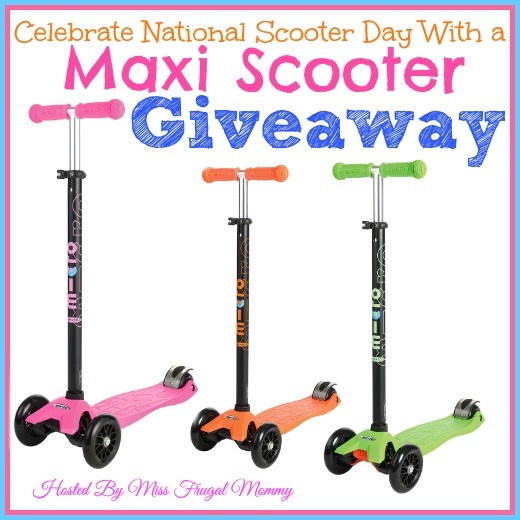 I learned that National Scooter Day is May 19th! I never knew that there was such a thing before! How fun! I love that they encourage the grown-ups to hop on a scooter too!